Couples off to the beach on their honeymoon will need a cute way to carry their beach essentials. Give the bride and groom this adorable terry cloth bag and they can stash their books, magazines, keys, ID, room key card, and sunblock in one stylish place. The roomy bag measures 20" x 16". 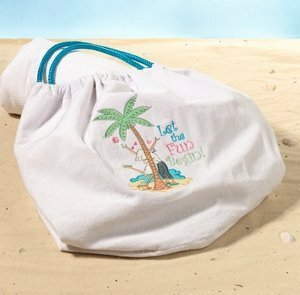 The lighthearted bag features white terry cloth body with aqua blue twine handles. It is done in fine embroidery. The front includes colorful graphics of a bride and groom kissing behind a palm tree. The words "Let the Fun Begin" adorn the front as well. Metal snap closure secures belongings. A sweet gift for the vacationing newlyweds.